October 2016 to September 2017. One year. More than 20 Countries. The plan: Leave Italy and travel the globe, discovering, adventuring and becoming “world citizens”! 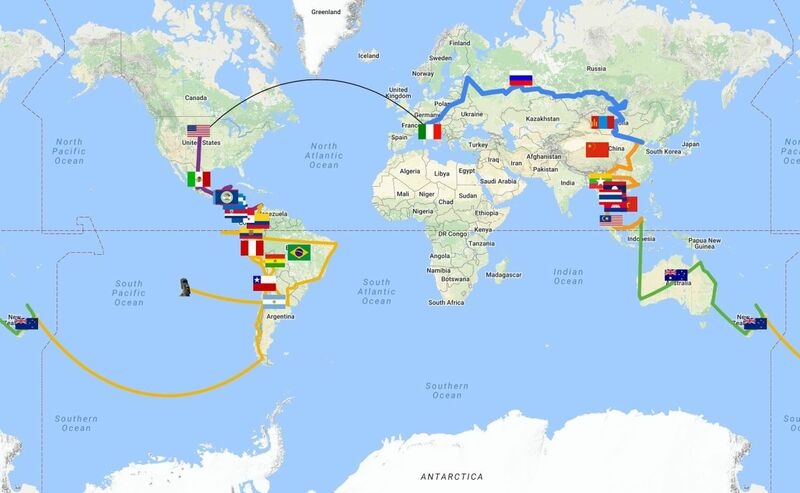 Our goal: To complete our round the world trip in under a year, visiting famous tourist attractions, as well as unknown places, whilst living and experiencing each country without time constraints. You can find links to articles, videos and pictures on our Complete Map! FYou can also follow our route LIVE on the map below. Just look for the last yellow icon to see our current location and check out where we have already visited! We’ll continue updating the map throughout our trip using a GPS app. 24 – 50 28/10/16 – 24/11/16 China Click here! 73 – 93 17/12/16 – 06/01/17 Thailand/Cambodia Click here! 93-110 06/01/17 – 23/01/17 Philippines Click here! 147 – 155 01/03/17 -09/03/17 New Zealand Click here! 155 – 160 09/03/17 – 14/03/17 French Polynesia Click here! 243 – ? ? – ? Perù Click here!